Now we'll learn how to hold and use a pick. The pick is more formally known as the plectrum. It is a small object held by a guitarist and used to strike the strings in order to create sound. Picks come in many shapes, sizes and are made in a variety of materials. The vast majority are triangular, or tear-dropped in shape, about an inch long, a millimeter thick and are made of plastic. The pick is held by the picking hand, as opposed to the fretting hand. And it is held between the pad of the index finger and the pad of the thumb. It should essentially be held as an extension of your index finger. It is very important to work towards making any and all motions you make while playing guitar as smooth, efficient as possible. Picking is included in this. In order to do this, we start by focusing on proper body mechanics. Start with good posture! Sit up straight and do not slouch. Next, from your shoulder, to elbow, to wrist, hand and fingers, keep your body light and loose. Do not tense up! Maintain all your tendons and muscles at a minimal level of tension. You only need enough pressure to hold you arm and hands in place. Likewise, with the pick in your fingers, you only want just enough pressure to get the job done. Not enough pressure and the pick will flop out of your fingers! But too much pressure is wasted effort and can over time hinder your ability to move quickly and effectively to the string or sturm. We want to avoid muscle cramping and tightness. So hold the pick lightly, not tightly! Next, find a comfortable place for your forearm to rest on the guitar. You can also place the side of your hand (or palm) on the guitar, bridge saddles or strings. I encourage you to experiment with all of them. The idea here is to find a good place for your arm to rest and from which your picking hand can pivot. 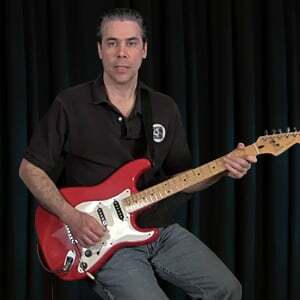 Remember to "choke up" high enough on the pick that your thumb and index finger have covered most of it leaving just enough sticking out in order to stike the strings. When striking the strings with a pick or your fingers do not "dig in" too far. This will only make it harder to get to the next string (or back over the same string in the opposite direction). Striking too hard or striking with the pick too deeply in between the strings also can cause the string to vibrate too excessively and make the note sound too sharp (too high in pitch). When strumming, it is important not to "dig in" too far also. This is best accomplished by working on "lightly grazing over" the strings instead of hitting them too hard or heavily. It can take a long time to become completely familiar with the fine motor skills involved in using a pick. So, it is very important to take your time, practice properly and carefully. Be patient with yourself and try to enjoy the process!